Xbox E3 2018 Briefing was a non-stop triple-a trailer barrage, but, for fans of RPGs and Disney, the biggest moment from Microsoft’s presser was reveal of the latest Kingdom Hearts III trailer. It provided a new look at the game’s much-anticipated Frozen World, with Elsa, Anna, Kristoff, and Olaf all being present and accounted for. 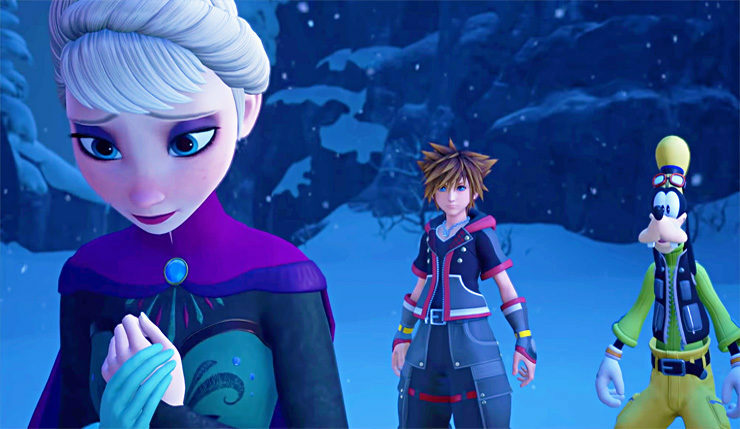 It seems Elsa hasn’t quite learned to “Let It Go” yet when Sora and pals meet her, as she’s still struggling with her ice powers. In addition to Frozen, we get fresh glimpses of previously-seen Hercules, Toy Story, Tangled, and Monsters Inc. Worlds. We also get a look at some of the game’s powerful Summons, featuring characters from Wreck-It Ralph and The Lion King, strange rail shooter sequences, and more. There’s a lot going on in this game, folks. Check out the trailer, below. Kingdom Hearts III was first announced back in 2013, but development, led by perfectionist series creator Tetsuya Nomura, has been slow-moving and shrouded in mystery. Trailers were released in 2014 and 2015, and it was anticipated Kingdom Hearts III might release sometime in 2015, but then all news about the game dried up. Understandably, there was some fear Kingdom Hearts III was stuck in development hell, but the game resurfaced at last year’s D23 Expo, and now seems to be coming together smoothly. So, what do you think? Are you excited for Kingdom Hearts III? Approve of the Disney franchises Square Enix chose to feature, or would you have preferred something else? I think they’ve made some pretty solid choices, although where’s my Oliver and Company and The Rescuers Down Under Worlds? Perhaps I’m dating myself a bit here. Believe it or not, Kingdom Hearts III finally has a release date – the game arrives on Xbox One and PS4 on January 29, 2019.